Atacama was the main point in our trip to Chile. Actually it was the reason we decided to visit the country in the first place. The oldest desert in the world and the driest non polar region sounds like enough reasons to put it on a traveler’s list, right? 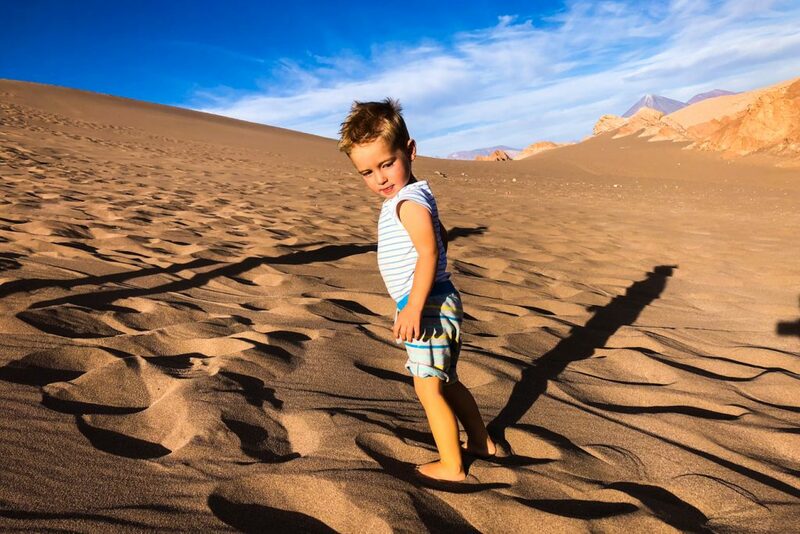 We were not sure how difficult it will be to visit Atacama with a toddler, but it was the right call to go there, as Eric enjoyed a lot the sand, dust and deserted scenery. 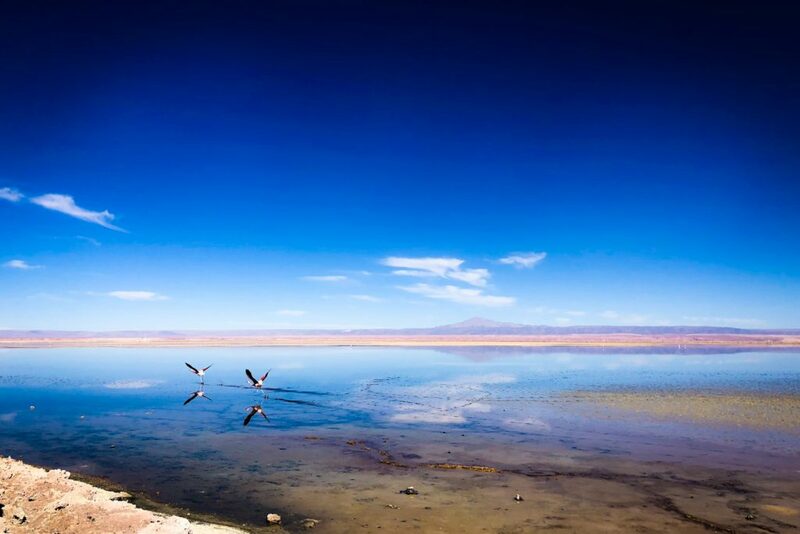 The easiest option to get to Atacama is flying from Santiago to Calama. Actually, we only found internal flights to this location. We would have preferred to fly straight from Lima, but it seems you must pass through Santiago to get here. 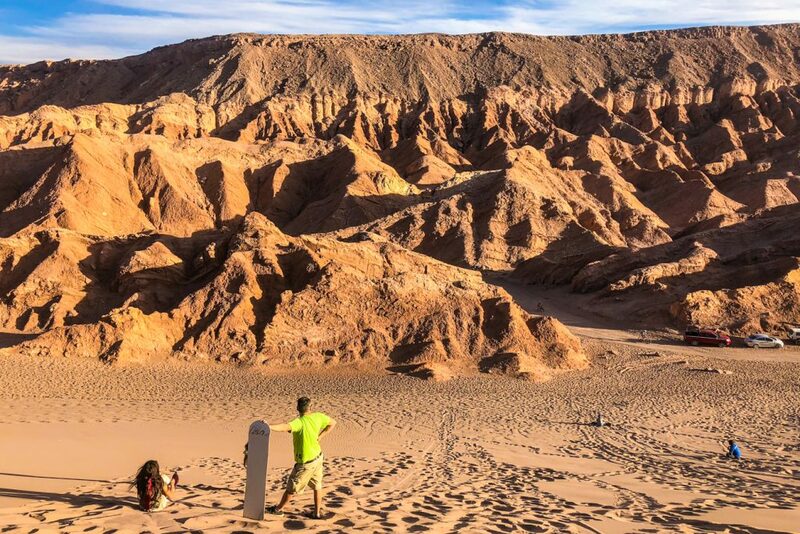 You can try of course the more adventurous option to drive to Atacama. 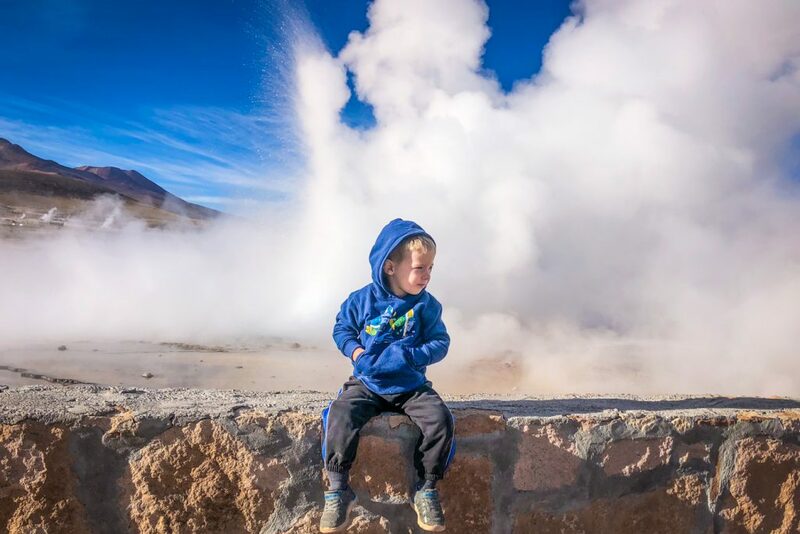 I’m sure the landscape is spectacular, but this can hardly be considered an option when you visit Atacama with kids. A road trip of more than 3,000km would be difficult even for me, not to mention how Eric would feel to spend that much time on the road. 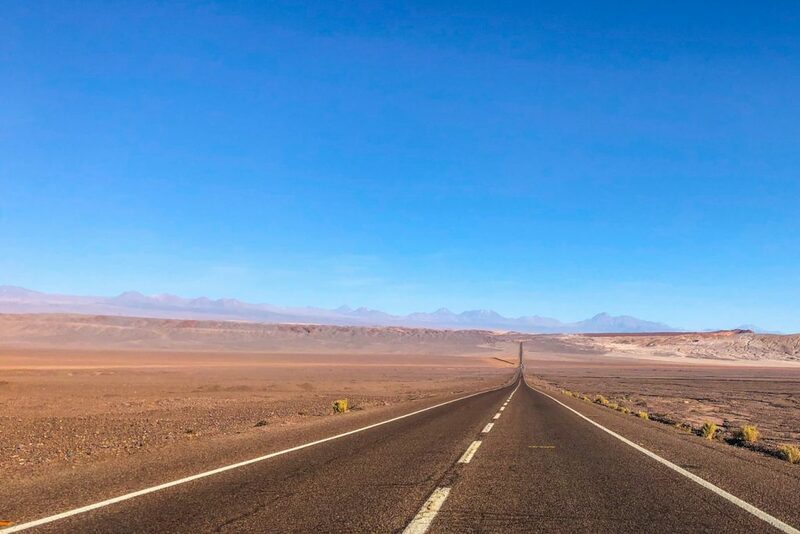 San Pedro de Atacama is about 100km away from Calama airport, which means 1.5 hours drive through the deserted landscape. There are several companies organising transfers, but we preferred the do it yourself option and rented a car. 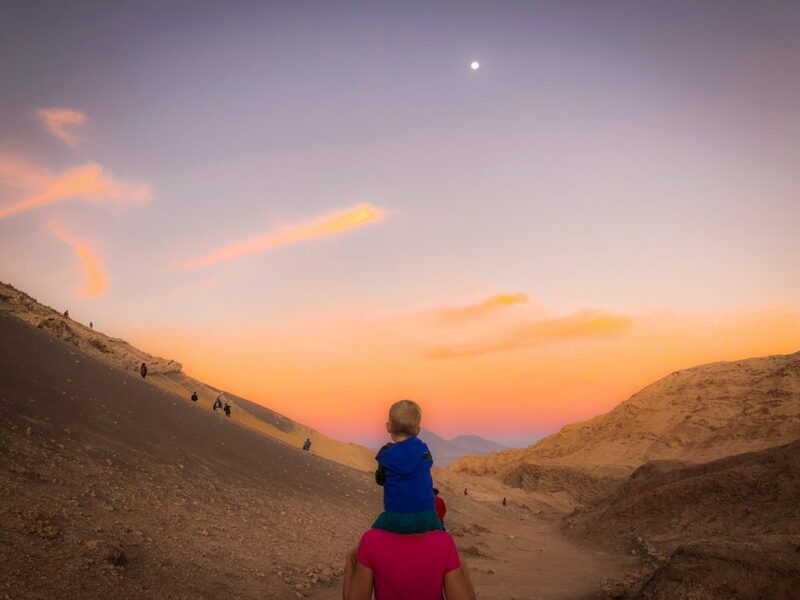 This way we could freely organise our time, the best option if you visit Atacama with a toddler. 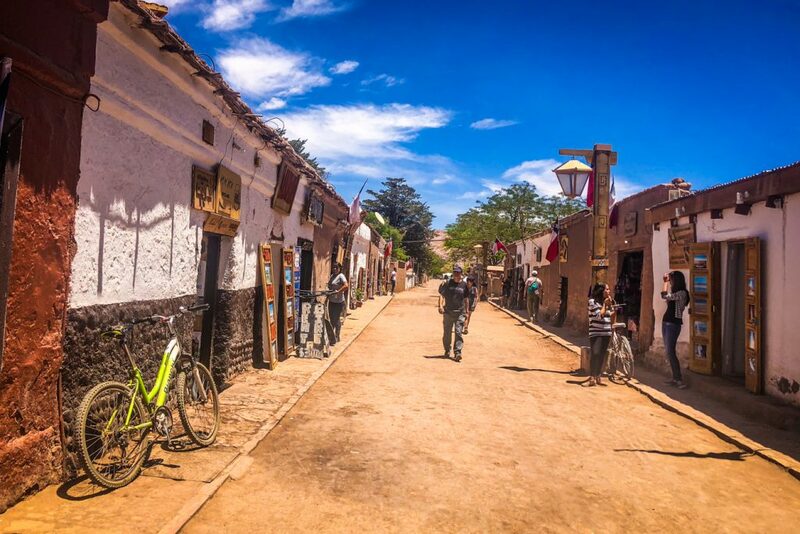 Tiny village in the middle of the desert, there’s not much to do in San Pedro de Atacama. The main street is flooded with touring companies organising various trips within the area or to Bolivia’s Uyuni Salt Flats. The souvenir shops are full of colourful hats or bags with traditional motifs, but you can find great mountain equipment too. We were not impressed at all by any of the restaurants and there are only 2-3 little shops to buy basic food. Luckily, we did some groceries shopping in Calama when we got in the region. 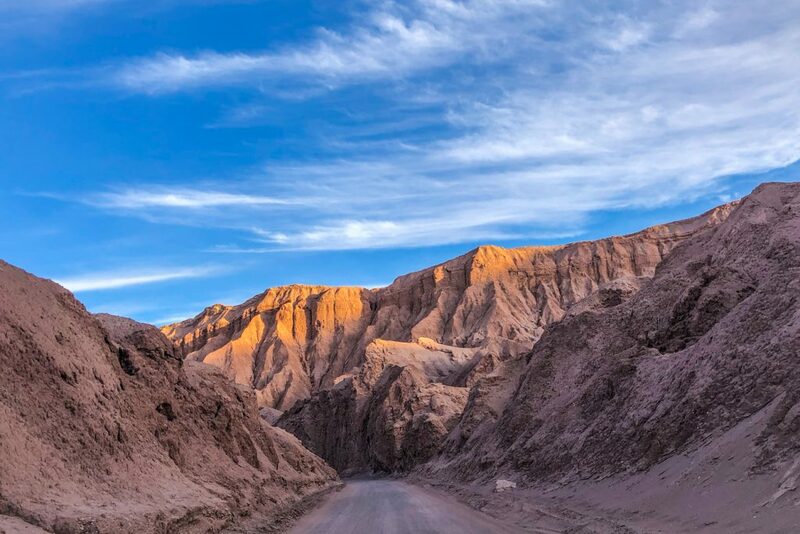 Everywhere you turn in San Pedro de Atacama, there is a red-golden dust; even the road is unpaved, so be prepared for it! Personally, I hated it, but the boys didn’t seem to care about such aspects. What was disturbing for all of us though was the extremely dry air. We have a small air humidifier which we carry with us to use mostly when Eric has a cold or stuffed nose. In Atacama we used it a lot during the night and we still felt uncomfortable. But, in the driest desert in the world, I guess this should not come as a surprise! 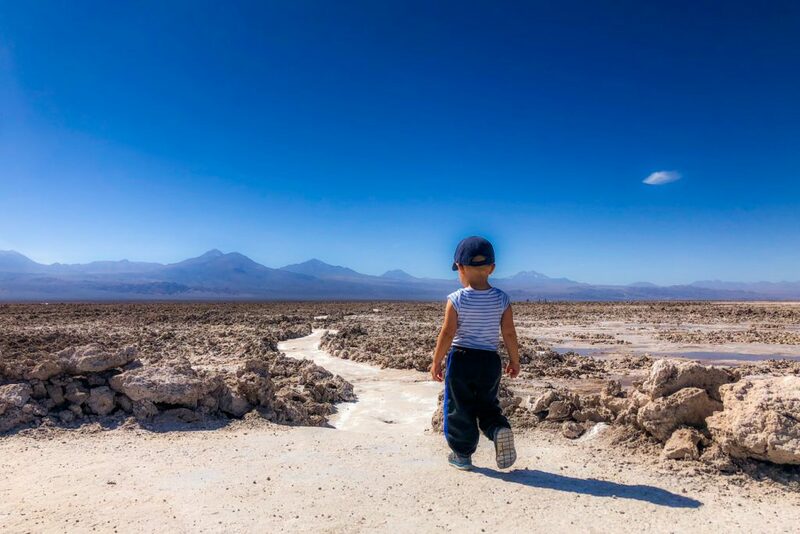 About 1 hour drive from San Pedro de Atacama starts the Atacama Salt Flat, or Salar de Atacama, the third of its kind in the world. Unlike other salt flats, it has large extremely rough dry areas, with no water throughout the year. We stoped on the northern side, at Lake Chaxa. This is a territory covered with shallow, very salted water, which beautifully reflects the surrounding mountain landscape. Laguna Chaxa is the home of large populations of flamingos. With this occasion, we also learned there are several types of flamingos in the world, quite different one to the other! So it took us more than 30 years to learn what Eric already knows at 2, from his own experience! On the way back to San Pedro de Atacama you can also visit Laguna Cejar, where you can bathe in the extremely salted waters. 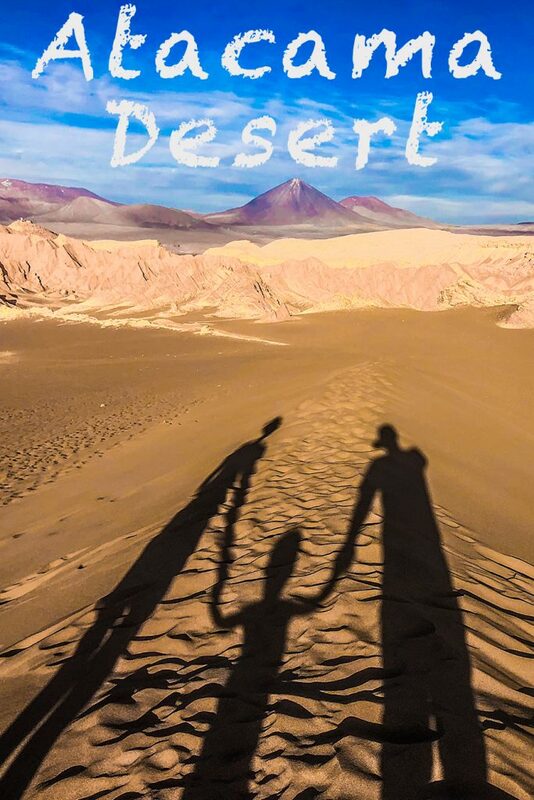 Very close to San Pedro de Atacama and perfect for an afternoon trip, the Death Valley, or Valle de la Muerte, is a rocky canyon taking you to tall golden sand dunes. If you fancy trying a new sport, the Death Valley is for you. The sand dunes here are said to be the perfect spot for sand boarding. 20-30 people seemed to enjoy it when we visited, but I wouldn’t exchange the real snow version for it! We had sand everywhere after just a half hour stay there, so I can hardly imagine how it is to fall and slide on your back on that slope. 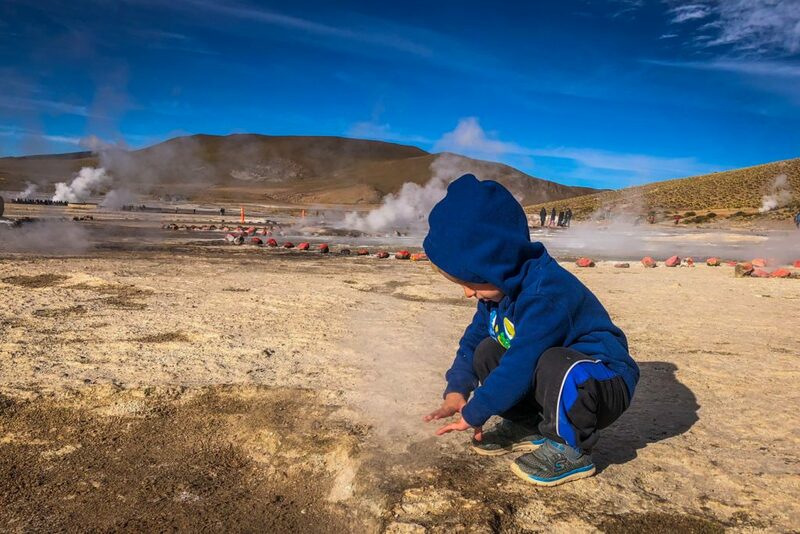 El Tatio Geyser is one of the most spectacular natural sights we’ve ever visited. Just picture a flat deserted area with countless steaming cracks in the soil or small ponds with bubbling boiling water, all surrounded by tall volcano peaks. 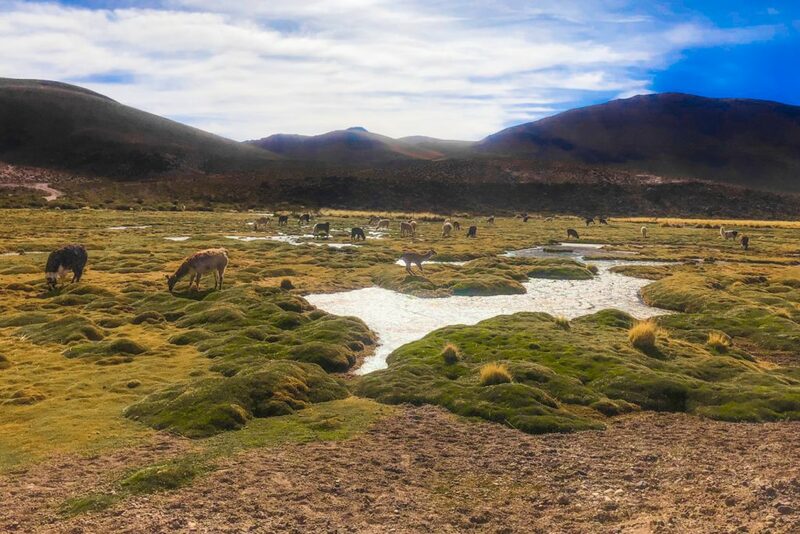 We were debating a lot weather going to El Tatio or not, mainly because of the high altitude. If you are not familiar with altitude sickness, we wrote more on this topic here. Located a bit over 4.500m, this is the highest altitude we’ve ever been, 1.000m higher thans Cusco which we visited a few weeks before. In the end we decided to take a shot, but not to spend too much time up there or return in case Eric does not seem well on the road. Luckily, he was great! Actually he was running happily around the visitors path, stopping just to warm his hands close to small steams. The main issue was not the altitude, but the very early wake up. 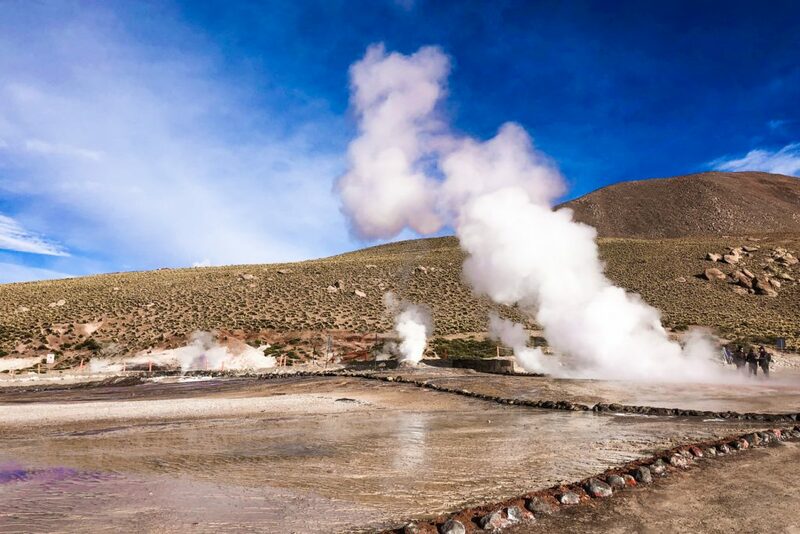 El Tatio is best to be seen early morning, while the air temperature is low, so that the steam is more impressive. We left San Pedro de Atacama little after 6 AM, driving 1.5 hours to get to the Geysers. On the way, the temperature dropped till -9 degrees, but at return it was already +10 degrees. This is just for you to understand the amplitude of the temperature changes due to the deserted area and high altitude. On the way back, a stop and bath at Puritama Springs should be very pleasant. 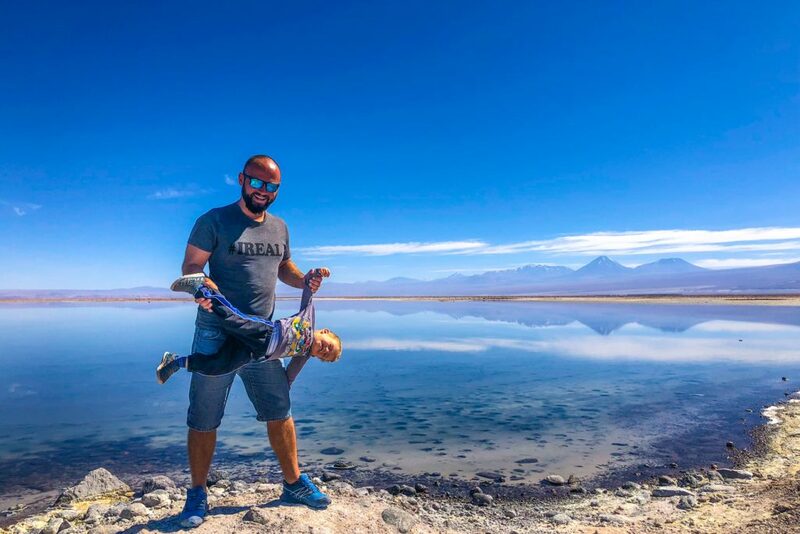 But since we were visiting Atacama with a toddler we had to skip thermal waters, as they are totally unrecommended for young kids. 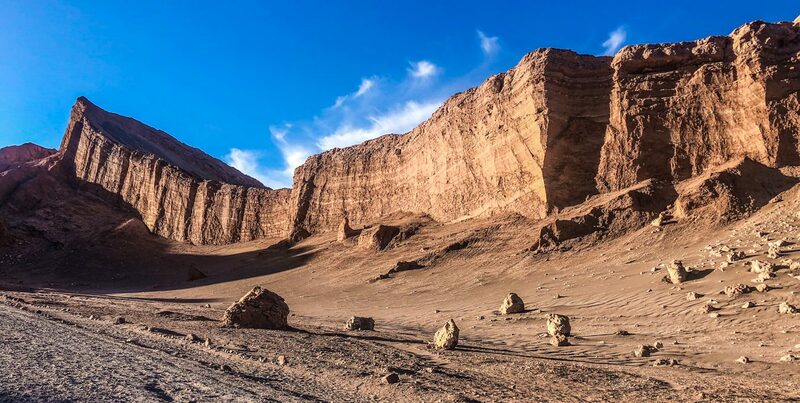 Just a few kilometres away from San Petro de Atacama there is Valle de la Luna, an interesting area with various stone and sand formation, in a multitude of shapes, colours and textures. Very spectacular, here you’ll really feel as if you are on an extraterrestrial location. I would advise to visit in the afternoon, to experience the sunset from one of the dunes. You’ll witness the sky changing in various shades of pink and purple, an image you can rarely see anywhere else! But don’t go too late to the Moon Valley, as we did. There are various trails to explore, saline caves and cliff tops offering magnificent panoramas. Make sure you have plenty of water and you are in a good shape. If planning to stay late, get some warm clothes too. The temperature drops by a few degrees within minutes after the sun is down. Multa bafta, sa calatoriti si sa ramaneti cat mai mult timp departe de monotonia vietii cotidiene! Have fuuuun! I would LOVE to visit this area, especially for the salt flats – I saw them on a documentary a few years ago, and it just looks absolutely stunning. Thanks for this guide; it’s really got me thinking about looking up some flights! 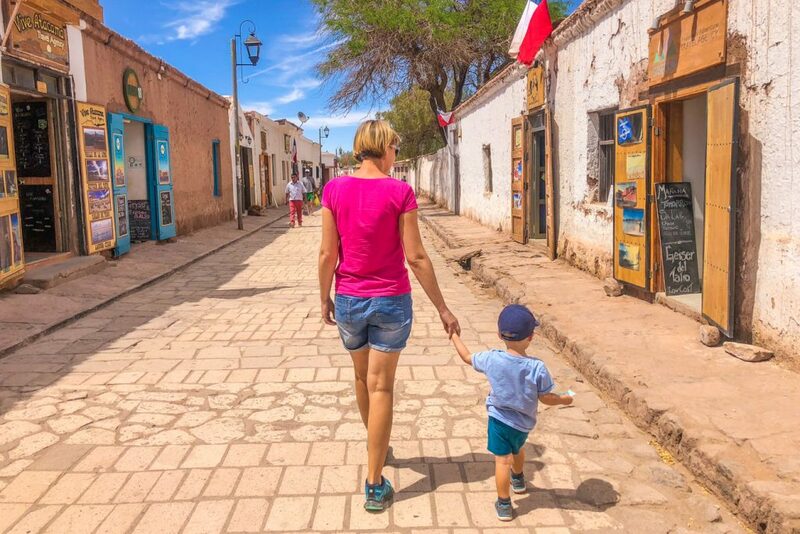 Happy travels, Atacama is worth a trip!